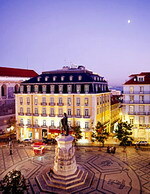 Lisbon (Lisboa) is the capital and largest city of Portugal. 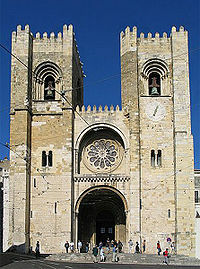 It is considered an alpha global city and is the seat of the district of Lisbon and the main city of the Lisbon region. Due to its economic output, standard of living, and market size, the Grande Lisboa (Greater Lisbon) subregion is considered the second most important financial and economic centre in the Iberian Peninsula. The Lisbon region is the wealthiest region in Portugal and it is well above the European Union's GDP per capita average – it produces 37% of the Portuguese GDP. It is also the political centre of the country, as seat of government and residence of the Head of State. The city was under Roman rule from 205 BC, when it was already a 1000 year old town. Julius Caesar made it a municipium called Felicitas Julia, adding to the name Olissipo. Ruled by a series of Germanic tribes from the 5th century, it was captured by Moors in the 8th century. In 1147, the Crusaders under Afonso Henriques reconquered the city for the Christians and since then it has been a major political, economic and cultural center of Portugal. Unlike most capital cities, Lisbon's status as the capital of Portugal has never been granted or confirmed officially – by statute or in written form. Its position as the capital has formed through constitutional convention, making its position as de facto capital a part of the Constitution of Portugal. 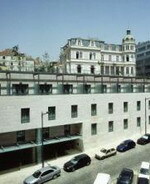 The Hotel AC Lisboa is a contemporary hotel housed in a three-storey building in the business district, 450 metres from Marques de Pombal Square. Guests can relax with a hot drink in the lounge and read the newspapers or get online via wireless Internet access. Health-conscious guests can work out on the hotel's fitness equipment and then unwind in the Turkish bath. Diners can sample contemporary dishes inspired by Iberian flavours, accompanied by an extensive regional wine list, in the Lisboa å Noite restaurant, while Mercado de Peixe offers freshly caught seafood. The hotel is located less than one kilometre from the theatres of Mayer Park, Eduardo VII Park, Avenida da Liberdade, the historic Barrio Alto district and the Botanic Gardens. Art-lovers will find the Centro de Arte Moderna, housing more than 10,000 works, 1.5 kilometres from the hotel. A modern boutique-style hotel in the fashionable Bairro Alto central area of the lively Portuguese capital, Lisbon. The designer lobby and other public areas boast Venetian- style marble floors and Moorish-inspired azulejos (wall tiles). Guests can unwind with a drink and a snack in the bar, work out with the fitness equipment then relax with a massage in the Wellness Centre, or browse complimentary newspapers in the lobby. The hotel's Flores Restaurant features glazed tiles, black-and-white photographs, mahogany tables and Italian table linen, and serves contemporary international cuisine with Portuguese and Far-Eastern influences. The Garret Café Baris is set in a two-level room and has a circular bar, white-marble flooring, glazed wall tiles and mood lighting. It serves cocktails, salads, sandwiches and tapas, and features music from guest DJs. The hotel is well placed to explore central Lisbon and its sights, being just 100 metres from the 16th-century-São Roque Church and 150 metres from the excellent shopping of the Chiado district. The modern ten story Hotel Marques de Pombal is situated in Lisbon city center, 100 meters from the historic square from which it takes its name. Deep colors and clean modern lines feature in the hotel's à la carte restaurant, which serves a range of international dishes for breakfast, lunch and dinner. Guests can work out in the hotel's fully equipped gym and sweat it out in the sauna and steam room. Drinks and cocktails are available at the bar. There is a beach 20 kilometers from the hotel, while the nearest golf course is six kilometers away at Quinta da Belavista. 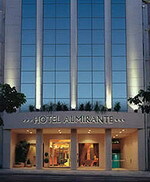 Guests will find themselves well located for exploring Lisbon. The historic center begins within 500 meters of the hotel and much can be explored on foot. The Eduardo VII Park is 100 meters from the hotel and the famous Belem area is eight kilometers away and easily reached by bus or metro. The Hotel Real Parque is a modern city-centre hotel situated in residential area 100 metres from the Spanish El Corte Ingles department store, and 200 metres from the serene gardens of Lisbon's renowned Calouste Gulbenkian Museum. With a black marble floor and lobby furnished with bright upholstered seating, the Hotel Real Parque offers a relaxed ambience for an international clientele seeking peace and quiet within walking distance of Lisbon's principal boulevard, Avenida da Liberdade, 600 metres away. A fine-dining restaurant serves a complimentary American-continental buffet breakfast and international fare for lunch and dinner. An informal lounge with bright upholstered seating offers a food and beverage service at a typical Portuguese bar from a glass case filled with sweet and savoury pastries and other snack foods. A coffee shop offers light fare. A flea market opens every Sunday morning at Mercado da Ribeira on the waterfront, two kilometres south of the hotel. 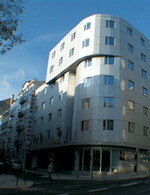 Hotel Tivoli Tejo features state-of-the-art curved architectural design with mirrored glass detailing. 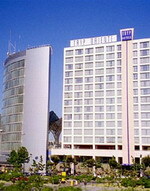 The hotel enjoys a riverside location in the Parque das Nações region, site of the Expo '98 World Exhibition. The Parque das Nações area boasts the new Vasco da Gama shopping mall and the Lisbon Exhibition Centre. Lisbon Portela Airport stands three kilometers from the property. 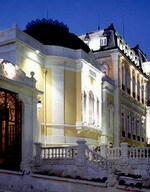 The hotel offers two dining venues and a bar. Ardina Restaurant serves Portuguese specialties for breakfast and lunch. Dinner is served on the 16th floor at the elegant A VIII Colina Restaurant. On the first floor, O Aguadeiro Bar also offers expansive views and welcomes guests to a warmly decorated room featuring plaid upholstered seating and carpets. To rejuvenate and entertain, the hotel supplies a Turkish bath and an indoor pool. Moreover, the hotel offers discounted green fees for use at nearby golf courses. 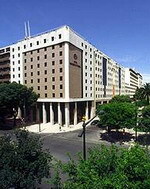 Hotel Tivoli Tejo enjoys a very accessible location. Only a two-minute stroll from the hotel, trains, buses and taxis converge at Gare do Oriente, a grand transportation station. The Hotel VIP Executive Madrid is a modern, six-storey property set in the centre of Lisbon, only five metres from the commercial district and shopping area of Marquês de Pombal Square. Guests can relax in the bar and lounge, warm up in front of the lobby fireplace, order snacks and drinks from the all-hours room service menu, and ask multilingual staff at the 24-hour front desk for tour assistance. Local attractions include the picturesque neighbourhood of Alfama, with its Moorish routes and Kasbah-like layout, just five metres from the hotel, and the Zoological Gardens with exotic and wild animals, three kilometres away. Lisbon Portela International Airport is approximately 20 minutes drive from the hotel, five kilometres distance. The Pestana Palace hotel occupies a listed 19th century palace with a modern annex overlooking its own sub tropical gardens in Lisbon. Guests can work or just unwind in the onsite health and fitness center, which incorporates a heated indoor lap pool, sauna, Turkish bath, Scottish shower and hot tub, as well as a fully equipped gym. Overlooked by an ornate summer house and with a fountain at its center, the outdoor pool is surrounded by a sun terrace and nestles in the hotel's gardens. High ceilings, ornate, gold painted coving and large antique paintings pervade in the grand restaurant, which enjoys views of the private park and serves Portuguese fusion cooking at lunch and dinner. The hotel offers onsite parking (surcharge), complimentary Internet access in the public areas and 24 hour front desk and room service. Business services include fully equipped conference and meeting rooms. 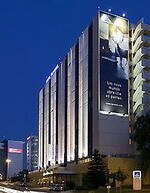 The Novotel Lisboa is an 11-storey building renovated in 2005, located by the business district in central Lisbon, within 100 metres of the Gulbenkian Museum, the metro and the bustling Praca de Espanha. The hotel's Latitude restaurant serves traditional Portuguese dishes, international fare and snacks in a modern, minimalist setting. Guests can enjoy a dip in the outdoor pool, relax with a drink in the bar, and order snacks and drinks from the room service menu. There is a self-service business centre with meeting rooms and limited complimentary Internet access. Practical amenities include a 24-hour front desk, a safe-deposit box and a parking garage (surcharge). The Gulbenkian Museum, 100 metres from the hotel, houses one of the world's largest private collections of Islamic, Egyptian, Far-Eastern, Greek and Roman art, and the historic Old Town and 12th-century castle of Saint George are within six kilometres. 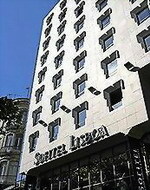 The Sheraton Lisboa Hotel and Spa is located in Lisbon, Portugal, 50 metres from the nearest subway station. 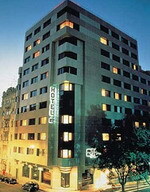 The hotel is within 2 kilometres of the city centre and Entrecampos train station. Casino Lisboa is 7 kilometres away. 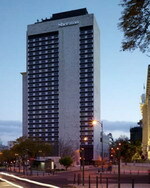 Situated in Lisbon's business district, the Sheraton Lisboa Hotel and Spa is among the highest buildings in the city at 28 storeys high. The Panorama Restaurant serves Portuguese dishes for lunch and dinner with a fantastic view of the city. The Lobby Bistro serves breakfast, lunch and dinner daily. The Lobby Bar and the Panorama Bar open each day and offer live music on selected evenings. An ultra-modern spa centre (surcharge) offers 10 treatment rooms, an outdoor swimming pool, hot tub, sauna, Turkish bath, and juice bar; access to the spa’s fitness center is complimentary. Saint George's Castle has served as a royal residence for the Romans, Visigoths, and the Moors. Located 4 kilometres from the hotel, visitors can climb the 18 towers for views of the city or walk in the gardens with the peacocks, geese, and ducks. The Sofitel Lisbon Liberdade is a contemporary property located in the centre of the business district, one kilometre from the bustling Baixa shopping area. After breakfast, guests can browse complimentary newspapers in the air-conditioned lobby and ask the concierge to help book tours and tickets. Health- conscious guests can tone up in the onsite fitness room, and benefit from discounted access to a local fitness centre. The hotel's contemporary Ad-Lib restaurant serves traditional Portuguese and French cooking prepared using seasonal ingredients. Open until late, Intra-Muros is a relaxed bar serving a range of drinks, including the famous Portuguese port wine. Motorists will find secure garage-parking facilities available on site, and valet-parking services are available on request (surcharges apply). Visitors keen to explore the area will find Lisbon's aquarium and zoo both within six kilometres. Those keen to try their luck will find a casino seven kilometres away. 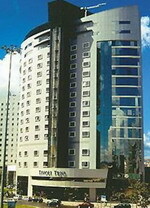 Hotel Tryp Oriente is a modern 16-floor hotel situated in the former Expo '98 site of Parque das Nacoes with views over Tagus river. Breakfast buffet, lunch and dinner are served in the Oriente restaurant which offers a menu of traditional Portuguese and international dishes. After breakfast guests can browse complimentary newspapers over a coffee in the bar. Internet connections are available for those who wish to plan a day out or keep in touch with family and friends. Multilingual staff on the 24-hour front desk can assist with currency exchange, room service requests and lock valuables in the hotel safe, as well as advising on local sightseeing opportunities. Many of the city's attractions are within easy reach of the hotel, including the Atlantic Pavilion 500 metres away, and the docks and the Oceanarium, both 800 metres away. Lisbon Airport is six kilometres from the hotel, around 10 minutes by car.